This letter from Joseph Little Bristow, 1861-1944, United States Senator, to Dwight David Eisenhower, 1890-1969, informs him of his nomination to West Point Military Academy. 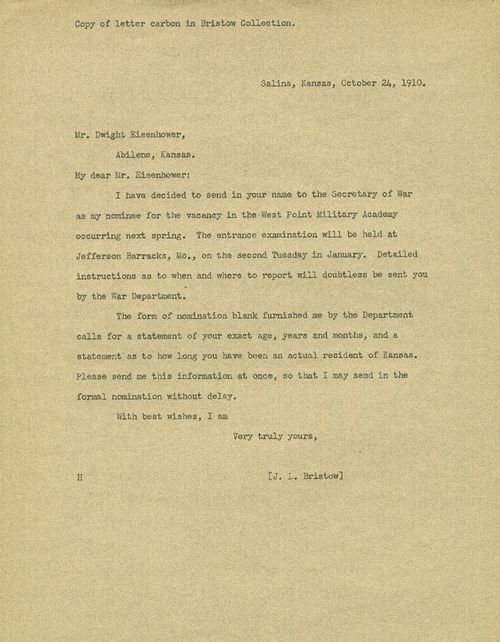 The complete set of correspondence related to Eisenhower's appointment to a military academy is available in Kansas Memory item 208267. This letter shows how Eisenhower's military career began. It can be used as a jumping off point to discuss Eisenhower's many accomplishments.